Last week, we visited some of our favourite destinations in Arctic Norway. Our mission was expanding our horizon and finding the very best accommodation, activities and places to visit. The following makes up just a fraction of what we found for you! Tromsø’s rise to fame in the last few years has been meteoric, and the vibey university town known as the Gateway to the Arctic is now rated among the top destinations to visit by Lonely Planet, Financial Times, and CNN, among others. It recently got voted the third best city in the world for experiences on TripAdvisor, so it´s worth planning in advance to get the best out of your visit. Magic Ice Bar: Tromsø got it´s own Ice Bar last May, which is now open for visits year-round. This is the perfect activity for when you’re tired, don’t want to travel far, and just need a drink! The first one is free with entrance. Beautiful sculptures paint the walls with Nordic and Sami history, and even the drink glasses are edible ice. Magic Ice Bar is also bookable for private events – imagine hosting your birthday here! Sommarøy Arctic Hotel: Located on the remote island of Sommarøy, this hotel is still only about an hour’s drive from Tromsø. Major renovations in recent years have transformed it into a glamorous place for a stay. Sommarøy’s stunning beach and mountain scenery is perfect for getting away from city life and offers a wealth of activities like zip-lining, snow-shoeing, beautiful hikes, and of course boat & fishing trips. After a day outdoors, warm up in a brand new modern sauna and marvel out the full-length window at the mountain view and clear water. You can get out of your comfort zone by running out onto the boardwalk and plunging into the crystal clear, ice-cold water! After a warm shower, sit by the suspended electric fireplace and laugh about your Arctic experience over whisky or Italian wine, while looking out into the night sky for Northern Lights. For an even better view, the hotel is right next door to a stunning white beach with clear waters. Did you know: Hosting a variety of dining options, Tromsø even offers a retro game themed burger bar called Burgr. It has the best reindeer burgers in town! Aurora Spirit Distillery: the Arctic spirit brand Bivrost is distilled and packaged at Aurora Spirit, the world’s northernmost distillery. If you’re flying with Norwegian, you’ll find it available in-flight (and it’s definitely worth trying). You can check out some of the Arctic viking stories behind the spirits, and can even get your own viking drinking horn at the distillery. A true viking distillery, Aurora Spirit produces some of the highest quality gin, vodka, and aquavit, using local Arctic ingredients and the freshest clean glacier water. The distillery is situated in the Lyngen Alps to get their ingredients fresh. You may encounter tastes such as dried arctic berries, juniper, citrus, and copper. The distillery is perfect in combination with more active outdoor activities like ice climbing, snow mobiling or RIB boat safaris, which are all at your fingertips in the Lyngen area. Lyngen Experience Lodge: If you want the Arctic experience with a true taste of luxury, Lyngen Experience Lodge is the place to be. This newly developed lodge is reachable from Tromsø by car, bus, or private boat, and even has its own helipad. Located on the sea in the Lyngen Alps, it is close to many exciting activities in Ullsfjord and the surrounding area. They have a private boat that allows for endless tailor-made options, from whale watching and ice climbing to dog sledding, ski touring, and more! Tired after a day exploring Arctic Lyngen? You can use the exclusive spa & sauna in Lyngen Experience Lodge. You can also wait for a view of the Northern Lights in their outdoor jacuzzi while sipping a glass of champagne. As the name suggests, this place truly is all about the experience (see our sunset video on Instagram, taken recently just outside the lodge). Did you know: The Northern Lights season is already in full swing and has made a strong debut! Check out this spectacular photo taken a few nights ago from Rundhaug Gjestegård. Klatrekafeen: This cute café on Henningsvær’s harbour, also known as Climber’s Café, is the #1 hangout place for climbers of the highly accredited North Norwegian Climbing School (also known as Nordnorske Klatreskole). Open until late for a lively crowd, you’ll find a mix of climbers, skiers, fishermen, and caravan campers sharing stories over a beer or three. Klatrekafeen has it’s own uber cool outdoor gear store with some of the warmest yet coolest hats and jumpers. Close by on the harbour are more restaurants and little shops to find cute souvenirs to bring back home. 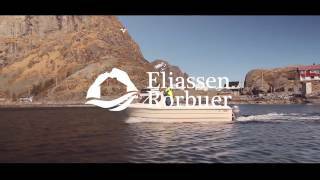 Eliassen Rorbuer: These fishermen’s cabins on Hamnøy combine the authenticity of the fishing village’s history and high-end accommodation quality. At night, photographers are out in position to capture the Northern Lights in spectacular surroundings – and with good reason. Hamnøy is the most-photographed fishing village in Lofoten, starring in many of the best Northern Lights and fjord pictures of well-known photographers (some on Instagram, here’s one of the more recent photos by Steven Henriksen). The view of the village is so spectacular that it now grazes the current edition of Lonely Planet! These cabins have a long history of use by the fishermen who earned their riches from the ‘Gold Rush’ of Norway in the early days. Fishing is still the main income of locals (after tourism) which is also a fun activity to try here. See the video below for an overview of the cabins, available to book through us. Did you know: Innovative chandeliers and interiors are a theme in Lofoten. Klatrekafeen has one made of cutlery, and our dried local cod has been used to make larger fabulous stockfish chandeliers at Anita’s Seafood Café in Hamnøy.